Everyone likes to do something a little special on their birthday, and Rolex is no exception. When the brand itself turned 40, for example, it gave itself a well deserved pat on the back with the release of the Datejust. But the world’s most successful watchmaker also has a history of celebrating the anniversaries of some of their biggest hitters by issuing specially revised models, particularly when they reach their half century. The practice has given us some exceptional and distinctive pieces, and below, we’ve picked out some of our favorites. Reaching middle age is rarely a dignified affair, but if there is one watch that can teach us how to do it in style, it is the Rolex Submariner. 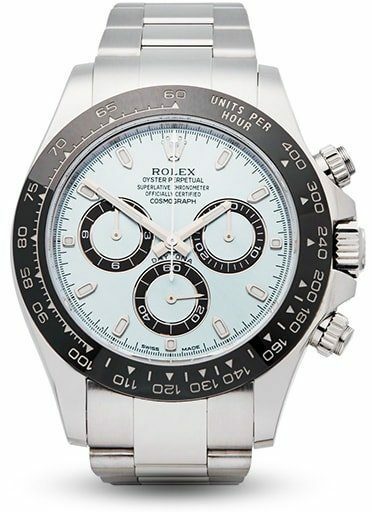 For the world’s favorite dive watch, the big five-oh clocked up in 2003 and was marked by the release of this, the ref. 16610LV. Identical in many ways to the standard-issue Subs of the time, it is the ‘LV’ portion of the reference number which holds the key. Standing for Lunette Verte, it was the first in the model’s five decade reign to have its iconic rotating bezel washed in an eye-catching green. It is a color that has always had a particular association with Rolex, bringing with it obvious connotations of money and wealth, and has been the basis of their official logo for many years. Including it on the revered Submariner, however, was something of an opinion splitter at first. For fans of the new look, the LV quickly became known as the Kermit. Those not so enamored call it the Vomit Sub! Along with debuting the color scheme, it was the first in the series to be given Rolex’s new Maxi dial, with larger hands and hour indexes—something originally introduced on the Yacht-Master back in 1991. Although a modern addition, it gave the birthday Sub a somewhat retro vibe that charmed many a brand enthusiast. These days, the Kermit is one of the most highly sought after versions of the Submariner from the more recent past. Its unorthodox appearance accounts for a large part of its appeal, but its comparative rarity is also a major factor. At first thought to be a special edition, the LV was actually included in the main lineup, but only for seven years. That leaves a relatively small and finite number available to collectors and prices are only ever on the rise. Where a brand new model in 2003 would have cost you around $3,800, just a few hundred more than the standard black bezeled piece, today a pre-owned version starts at about $12,000. For reference, the current retail price for the steel Submariner Date is in the region of $8,500. But it is possible to spend a great deal more. During its brief run, the Kermit went through two extremely minor design changes, which can add significant amounts to its bottom line. Firstly, in 2007, Rolex started laser engraving their brand name on the watch’s rehaut in an attempt to counter some of the more sophisticated forgeries which had begun to emerge. The earlier, pre-engraved models are now considered more valuable. And secondly, at some point a slight machining defect gave us what are known as the Flat 4s, where the first digit on the bezel’s engraved ‘40’ marking has a squared off top, rather than coming to a point as they do on all the other examples. Quickly corrected, the Flat 4 editions are extraordinarily rare and therefore painfully expensive. Like the Submariner, the GMT-Master started life as another tool watch created in order to fulfill a definite purpose. And again like the Sub, by the time its 50thbirthday rolled around in 2005, it was far more about status symbol showmanship than anything utilitarian. So it was only fitting it was given the golden treatment on its anniversary, and Rolex commemorated the event with the release of the ref. 116718LN. This time, the LN stood for Lunette Noir, meaning ‘black bezel’, and it was the very first model in the catalog to be issued with a surround in the brand’s proprietary Cerachrom. Special occasion or not, it was a strange decision by Rolex to choose the GMT-Master to unveil their new ceramic material, seeing as they were yet to perfect the method of adding a second color to it; a two-tone palette has been very much the calling card of the ultimate luxury traveler’s watch since the beginning. Still, the solid black bezel encircled the GMT line’s first Maxi dial, painted a rich forest green, and both were set off lavishly by the 18k yellow gold shell. While it retained the same 40mm dimensions of models past, this was also the watch to debut the broad-shouldered lugs and thicker crown guards of the next generation Super Case, giving the watch as a whole a much bigger and more muscular look on the wrist. Other modernizations over previous models included an upgrade from a Twinlock to a Triplock winding crown, polished center links and the Easylink fast adjustment system on the Oyster bracelet, and the introduction of the new Cal. 3186, which brought a Quickset date function and Parachrom Bleu hairspring to the GMT for the first time. As for prices; although obviously not cheap what with all that 18k gold on display, it is still part of the current tribe of contemporary watches. That means its value hasn’t been affected so much as if it had gone out of production. It has more recently been joined by a black dial edition, but still with a small splash of Rolex’s signature green, this time on the 24-hour hand. Both versions retail for around $33,100. First appearing in 1963, the Daytona, perhaps the most famous chronograph watch ever made, wasn’t given its big birthday bash until 2013. However, it was worth the wait. On the run-up to the unveiling, rumors abound of a long-awaited steel version topped with Rolex’s still novel Cerachrom bezel. It was proof, as if it were needed by then, of just how far the watch had come from its inauspicious, manually-winding beginnings. The one they couldn’t even give away for 25-years had gone full circle and now sat at the very head of the table. What’s more, Rolex were clearly not interested in hiding their light under a bushel. The ref. 116506 was designed to stand out, albeit in a rather more cultured way. Most striking, of course, is the dial. The gorgeous ice blue is reserved only for the brand’s platinum pieces, and perfectly offset the trio of sub counters with their outer rings in a deep chocolate brown. The bezel, which was indeed made in Cerachrom, matched the color, giving the whole watch an aesthetic all its own—a statement piece for uncompromising, and well-heeled, fans. Inside, the manufacture Cal. 4130 has been setting the standard for chronograph movements since it took over the duties from Zenith’s heavily reworked El Primero in 2000, the last caliber Rolex ever used supplied by a third party. The column wheel-controlled, vertical clutch in-house mechanism is recognized as one of the finest of its type. Like the GMT above, the 50thanniversary Daytona is still being produced, and now has a second version which omits the brown outer rings on the sub dials for an all over ice blue face. Which brings us to the money. On its release, the ref. 116506 retailed for $75,000. However, unlike many of Rolex’s steel tool watches, which just seem to go up in price on the pre-owned market, a nearly new example of the only platinum Daytona can be had for far less than its original MSRP. It is not unusual to see them for sale for a good $10,000 less than their 2013 rate. So what can we expect from Rolex in the way of anniversary pieces in the future? Well, with a few exceptions, the 50th birthday of most of the classic pieces has been and gone. The next watch to have its 50th is the Explorer II, which comes of age in 2021. But it is hard to imagine the brand doing anything particularly radical there—in fact, they have spent the last 48 years actively avoiding making anything other than the most cursory modifications. The most recent model to celebrate its half century was the Sea-Dweller in 2017. Rolex released the ref. 126600, which gained three millimeters over its predecessor and was given a Cyclops lens, although it wasn’t officially an anniversary edition, merely the newest version to go into production. The year before that, the Day-Date was thrown a low-key 60thbirthday party with a dial in Rolex green. But as the watch is already available in just about every shade known to man, it wasn’t exactly groundbreaking either. Many fans are hoping for big shakeups when the brand’s other icons turn 70 or, more likely, 75. Top of the list are a reworked, bigger Submariner in 2023 (or 2028), or a long overdue Coke-bezeled GMT-Master II a couple of years later. Whatever happens, logic would suggest we have a little while to wait, although I wouldn’t bet against Rolex surprising us all. As always, we will keep you up to date with all the developments.